Congratulations to the 2019 Hyundai Santa Fe for winning Auto Judge SUV of the Year. Read Alan’s impressions on the newly re-designed SUV to see why Hyundai has designed a winner. When the assembled group of journalists saw the line-up of Hyundai Santa Fe vehicles at the launch event, they immediately began taking photos and asking questions. This was the ‘new’ 2019 Hyundai Santa Fe. 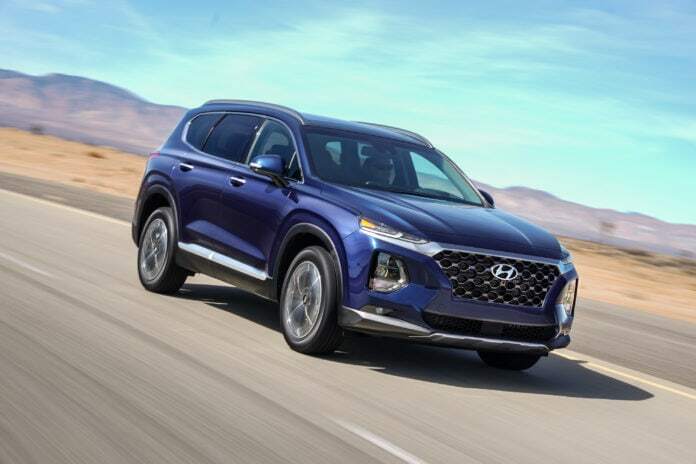 Maybe it is not an all-new vehicle and nameplate, but this model is a really big deal because Hyundai is pushing this as something special for family adventures, and it appears as if they are definitely on the right track. This is the fourth generation of the Hyundai Santa Fe SUV. There was a 5-passenger model that was called the Santa Fe Sport. This year, the 5-passenger SUV is simply called the Santa Fe. The previous larger model Santa Fe for seven persons is now being referred to as the three-row XL, and that might be dropped or changed in the future. Meanwhile, this 2019 Hyundai Santa Fe SUV begins to impress you as soon as you see it and continues as you spend time driving it. August and September 2018 was a special time for automotive journalists that follow Hyundai automobiles. Two press/media trips were held to introduce the ‘new’ Hyundai Santa Fe and allow lengthy test-drives and interaction with company representatives. Between the Utah and Alabama events, almost all nationally-known automotive journalists were invited and I was fortunate enough to have been included. The media events were different in their driving routes and challenges, but the Santa Fe did what it was supposed to do: flex its muscles, look good inside and out, and offer the test-drivers a quiet, safe, refined ride. The interior of the 2019 Hyundai Santa Fe is spacious and everything is intuitive, easy to find and to use. The ‘new’ 2019 Santa Fe offers five trim levels: SE, SEL, SEL Plus, Limited, and Ultimate. The SE starts at $25,500, the SEL at $27,600, the SEL Plus at $29,800, and the Limited at $32,600. The top-of-the-line Santa Fe Ultimate tarts at $34,200. There are not a lot of options for 2019, although that may change in the future. The most obvious option appealing to most buyers is the All-Wheel-Drive system at an additional $1,700. The Limited and Ultimate trims offer an optional 2.0-liter turbocharged engine for an extra $1,650. The Hyundai Santa Fe is EPA rated at 22 mpg city, 29 mpg highway, and 25 mpg combined average. This varies slightly if the turbocharged engine or the AWD system has been added.. A host of safety and comfort features has been added to this 2019 model, all using a variety of technology in the form of sensors, radar, cameras, and more. The safety features are those designed to prevent a potentially dangerous situation from happening, such as backing up, changing lanes, or pulling out into on-coming traffic. Other technology features includes so many of those item commonly found on more expensive vehicles, all designed to satisfy the driver’s and passengers’ needs for more convenience and premium-styled comfort during the ride. BOTTOM LINE: The re-designed (& re-named) 2019 Hyundai Santa Fe is a wonderful 5-passenger compact crossover SUV. It has ‘muscles’ in all the right places to offer great family adventures while comforting and protecting family members. The refined handling continues to comfort and protect whether it is a long road trip or a short hop to the mall, ballgame, or other activity. It is a well-rounded utility vehicle that meets the needs and wants of today’s family.